Recently I had the extreme pleasure of joining fellow Bond fanatics Brad Hansen, Athena Stamos, Ryan Provencher and Bob Mitsch to record the Ultimate BONDCAST in which we individually ranked and then debated which James Bond films we consider the best (and worst). In the end, the average of our rankings revealed the Best James Bond film of them all! It was a marathon night and now it's a marathon podcast (nicely edited by Brad Hansen). I know this is about the movies and not the books, but I hope you'll have a listen anyway. Enjoy! @will_south70 Only that I've started work on it. Horowitz's "James Bond book 2" will be released by Jonathan Cape in the UK in 2018. You can read more HERE. A loyal reader from North Carolina recently attended a book signing for Jeffrey Deaver's new novel, The Burial Hour. Deaver was the author of the 2011 James Bond continuation novel, Carte Blanche, which rebooted 007 into the present day. At the time the author said he was open to writing another Bond, and that he might set it in Australia. 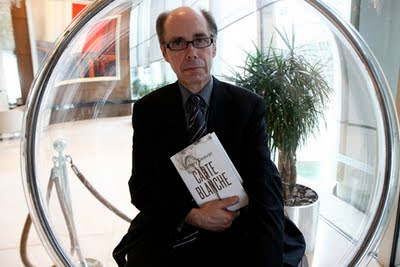 During the signing Deaver was asked if there were any plans for that second Bond novel. Deaver revealed that he had been approached to do one, but decided to turn it down. He said he didn't care for the amount of creative oversight and the monetary split that comes with doing a Bond novel. Will we ever see a continuation of that modern day James Bond timeline? If so, it appears it won't be Deaver doing it. Thanks to our friend in NC for this. 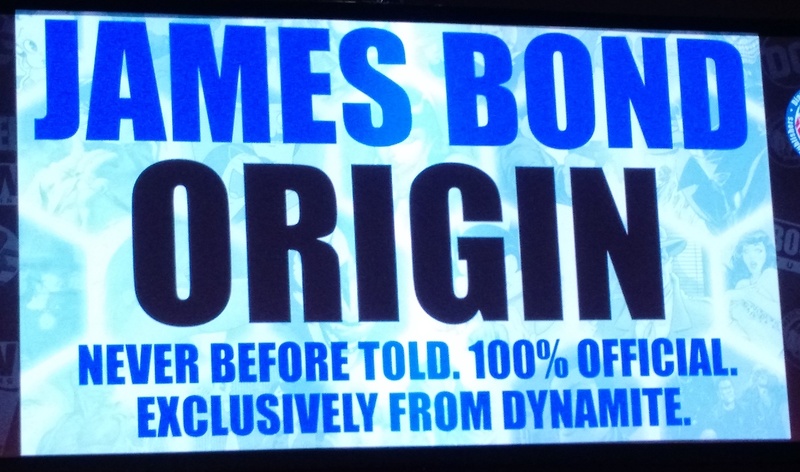 Bleeding Cool reports that Dynamite Entertainment revealed huge news about their James Bond comic line at the Diamond comic book retailer summit in Chicago. An upcoming series will explore the "never before told" origin of James Bond 007. 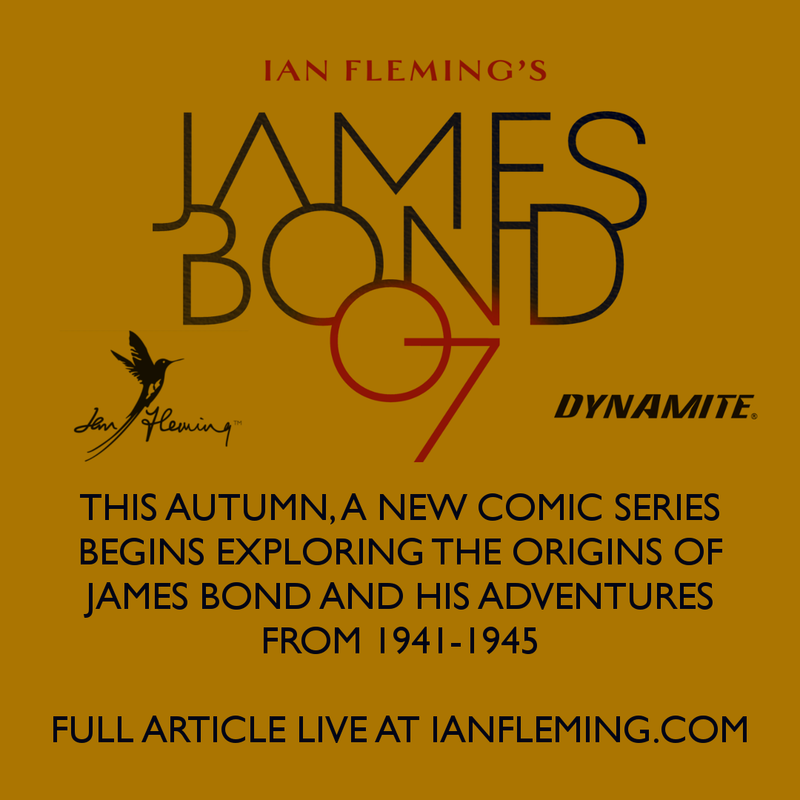 This will be the 100% origin story of the secret agent James Bond, officially approved by the Ian Fleming estate. The creative team have not yet been announced, but Bleeding Cool understands that it is intended to be set in the original James Bond timeline, with his adventures in World War II. Of course, James Bond's origin was explored in the semi-official James Bond The Authorized Biography of 007 by John Pearson as well as the Young Bond novels, but this is still pretty exciting! Full details on the Dynamite panel at Bleeding Cool. UPDATE: The official Ian Fleming Publications website has confirmed the World War II timeline and provided a few more details HERE. This has been a big month for anniversaries, so how about another! 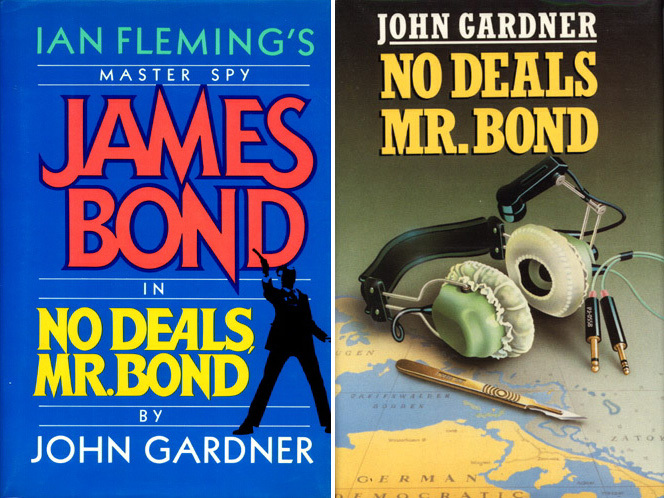 It was 30 years ago that John Gardner's sixth Bond novel, No Deals, Mr. Bond, was released by Putnam. 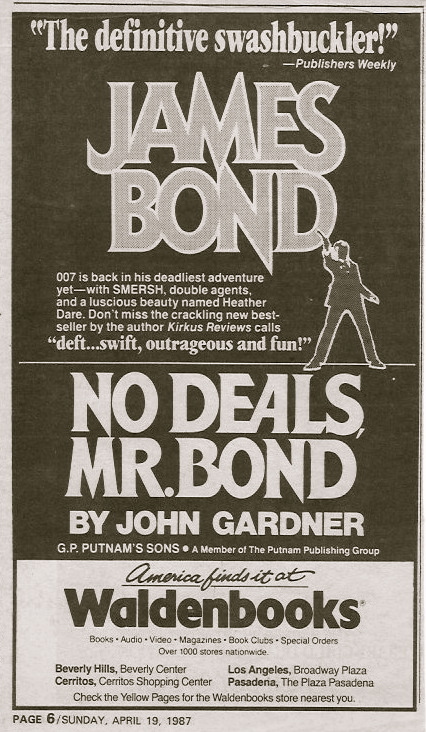 Unlike most of the Bonds, this one first appeared in the U.S. I'm not sure of the exact date of publication, but the ad below appeared in the April 19, 1987 Los Angeles Times Book Review, so we'll let today be the anniversary. My own recollection of No Deals Mr. Bond was finding it in the University Village Waldenbooks during my second semester at USC. I was so involved in school, I didn't even know when this one was coming! 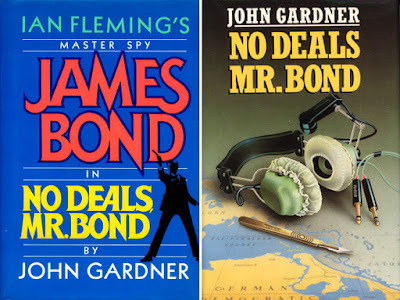 Sorry to say it was not one of my favorite Gardner books, then or now, but each Gardner title holds a special place in my memory, and looking at the cover of No Deals still brings me back 30 years. U.S. edition from Putnam (left). UK edition from Jonathan Cape (right). No Deals, Mr. 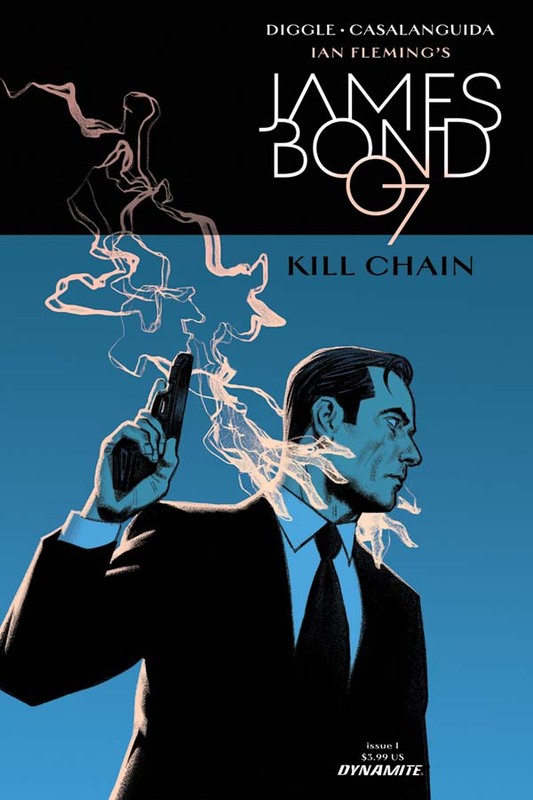 Bond is available in a new reprinted edition via Amazon.com (U.S.) and Amazon.co.uk (UK). 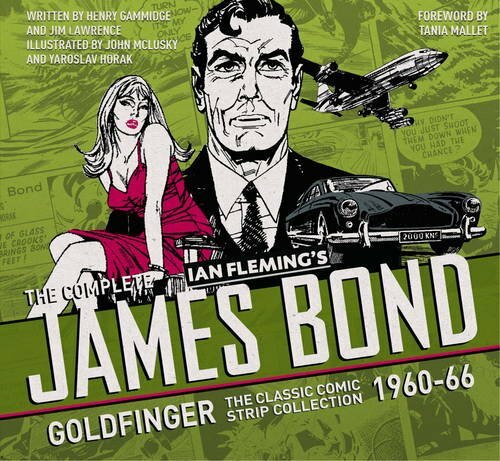 Titan Books has released The Complete James Bond: Goldfinger - The Classic Comic Strip Collection 1960-66. The book is a hardcover and collects the vintage Daily Express comic strips of: Goldfinger, Risico, From A View To A Kill, For Your Eyes Only, The Man With The Golden Gun, and The Living Daylights. 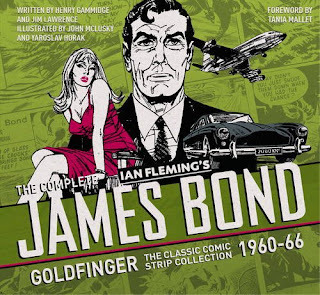 Purchase James Bond: Goldfinger - The Complete Comic Strip Collection 1960-66 on Amazon.com (U.S.) and Amazon.co.uk (UK). 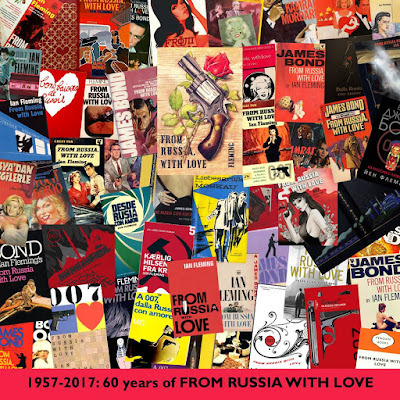 Ian Fleming's From Russia With Love celebrates its 60th Anniversary this month (first published April 8, 1957). 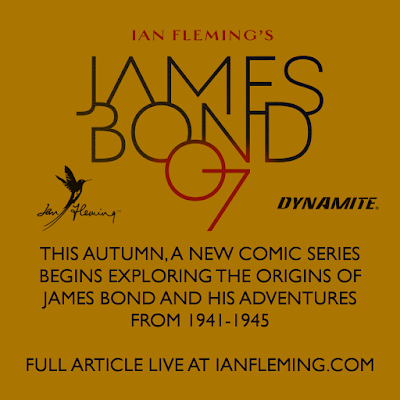 To mark the occasion, Ian Fleming Publications has released this anniversary image and is holding a special competition. Details below. First published in the UK on the 8th April 1957, Ian Fleming's legendary James Bond thriller FROM RUSSIA WITH LOVE is 60 years old today! The novel, famous for its inclusion on President Kennedy's top ten book list, has been published and enjoyed all over the world, with many fans citing it as their favourite Fleming thriller. With its unforgettable sequences on the Orient Express, in the backstreets of Istanbul and in the dark corridors of the SMERSH headquarters, we're very pleased to announce this anniversary and encourage readers old and new to delve into the pages of this 50s classic. Help us celebrate and win some special James Bond prizes by entering our cover design competition, details HERE. 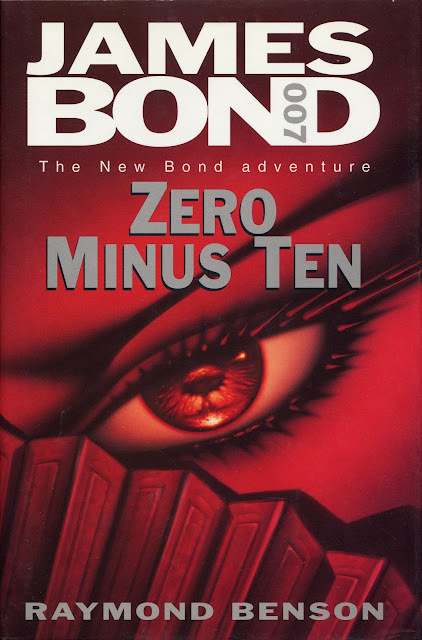 It was 20 years ago this month (April 3) that Raymond Benson's first continuation novel Zero Minus Ten was published in the UK by Hodder & Stoughton. 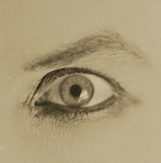 It marked the first of six original novels and three novelizations by the author. In the Australian desert, a nuclear bomb explodes. There are no survivors, and no clues about who has made it or detonated it. 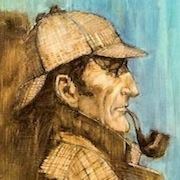 These apparently random events are connected–and Bond must find out how and why. From the seedy strip clubs of Kowloon, 007’s investigations bring him into conflict with ruthless Triad gangs, a power-hungry Chinese general–and a beautiful night club hostess called Sunni Pei. Zero Minus Ten was released in the U.S. by Putnam on May 5, 1997. Author Steve Cole has signed the full stock of limited Red Nemesis hardcovers, as you can see below from his recent tweet. The book will be relased on May 4. It can be pre-orderd at Amazon.co.uk.